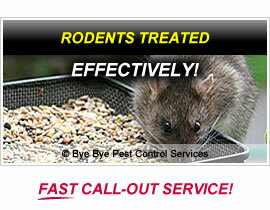 Bye Bye Pests control services are a family based business owned and run by two brothers George and Phil which has been established since 1996. 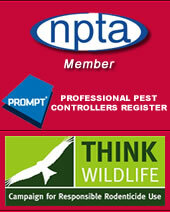 We are a Servicing Member of the NPTA (National Pest Technicians Association) and take an active part in promoting the objectives of the association. We have also been awarded the RSPH level two certificates in pest control, which was awarded by the Royal Society of Health. We also carry ID cards to certify that we are members of the BASIS PROMPT register, which is a register of managers and technicians providing professional pest control services and advice. 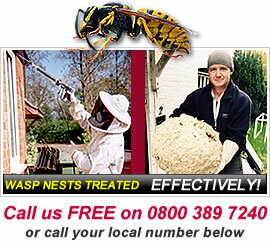 Call us for a fast and effective removal of your wasp nest in the following areas. Basingstoke, Fleet, Reading, Alton, Newbury, Southampton, Bracknell, Haslemere, Winchester, Maidenhead, Petersfield, Slough, Andover and Camberley. If you think you have a wasp nest our best advice is don't try to deal with it yourself. Disturbing a wasp nest is highly dangerous, and is best left to a qualified pest control technician. We offer a fast insect call-out service to the following areas; Pest Control in Basingstoke call - 01256 332121 : Pest Control in Fleet call - 01252 308262 : Pest Control in Reading call - 01189 639151 : Pest Control in Alton call - 01420 409038 : Pest Control in Newbury - call 01635 818151 : Pest Control in Bracknell call - 01344 669655 : Pest Control in Winchester call - 01962 70815 : Pest Control in Petersfield call - 01730 406036 : Pest Control in Andover call - 01264 839034 : Pest Control in Slough call - 01753 709427 : Pest Control in Haslemere call - 01428 769036 : Pest Control in Maidenhead call - 01628 439205 : Pest Control in Southampton call - 02380 308151 : Pest Control in Camberley call - 01276 805232. View our page on insects including wasps here. Our client list includes schools, housing associations, councils, building companies, pubs, estate agents, restaurants and many other various small and large companies. To arrange a survey and quotation at your premises for a cover that suits you and your type of business, call us now. References available on request.